The Gourmands’ Way by Justin Spring, reviewed. Americans in Paris like Julia Child and M.F.K. Fisher are famous for educating their compatriots about quality cooking. But did they miss its raison d’être? 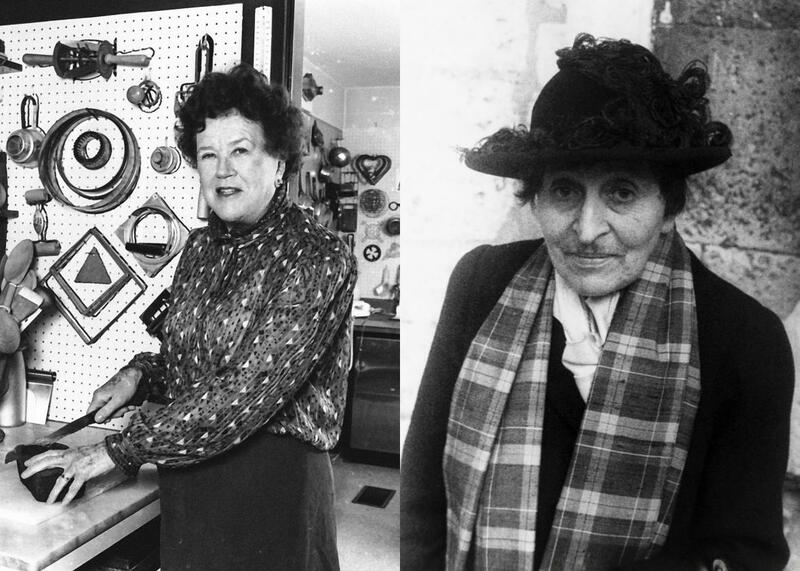 Julia Child and Alice B. Toklas. Photo illustration by Slate. Photos by Rick Friedman/Corbis via Getty Images and Corbis via Getty Images. The vastly overused French word gourmet indicates, in its original meaning, a connoisseur, someone who is not only knowledgeable about food but also highly exacting about all issues regarding fine dining. A true gourmet is likely to be rather conservative and lack patience for any form of indulgence. The lesser-known term gourmand describes, on the other hand, a person with a somewhat voluptuous appetite and whose pursuit of satisfaction via the pleasures of the table can border on obsession. In France, the latter term is likely to be used as a good-natured admonishment, possibly accompanied by some gentle finger wagging. But of the two, it is arguably the gourmand who is the more radical and, thus, worthier of closer examination. Justin Spring’s new book, a literary group portrait titled The Gourmands’ Way: Six Americans in Paris and the Birth of a New Gastronomy, illustrates why Julia Child, M.F.K. Fisher, Alexis Lichine, A.J. Liebling, Richard Olney, and Alice B. Toklas earn the more intriguing moniker. Each of these icons of food writing was self-determined and headstrong individualists in matters of food as well as the way they conducted their compelling, highly diverse lives. Spring’s book is both a critical and highly entertaining chronicle, beginning in the aftermath of World War II, when the French began to recuperate from the German occupation and felt quite gourmand themselves after years of food deprivation—a perfect moment for a handful of American epicures to arrive on the scene and stake their claim in it. Weaving his way through their intriguingly intersected paths, Spring brings each of his six subjects (as well as a fair share of colorful side characters who orbit them) to life with psychological insight and a sharp focus on historical context, backing up his findings with meticulous, near-forensic research. Prior to picking up The Gourmands’ Way, I was already quite familiar with the writings of Toklas, Fisher, and Olney, and I knew of Julia Child and her iconic television cooking show. Spring’s collective memoir answered many questions I still had about each of them, often confirming my hunches, like Alice B. Toklas’ decision to include a chapter with recipes from friends in her first cookbook as a solution for not having enough recipes of her own to fulfill her contract. It’s a wonderful example of the way history is shaped by happenstance, for her decision led to the inclusion of the infamous hashish fudge recipe by Brion Gysin that became so instrumental in making The Alice B. Toklas Cookbook a succès de scandale. Indeed, Spring seems particularly affectionate about Toklas, who already figured prominently in his previous book, Secret Historian. Highlighting the quintessential closing chapter of The Alice B. Toklas Cookbook in which she compared her feelings toward the vegetables she grew in her and her partner Gertrude Stein’s garden to those of a mother for a newborn child, Spring makes a compelling case for Toklas as one of the two among his sextet of players whose approach to cooking had a metaphysical component. Toklas, like the much younger Richard Olney, understood that good cooking is never merely a mundane act of preparing food but a deeply personal offering of attention, generosity, and love, and that the soul-nourishing apotheosis of cooking can never be found in a restaurant but only in the private, domestic realm. Occasionally, Spring is less tender to his subjects, such as when his research allows him to dole out a well-aimed stab at the more inflated myths surrounding them. The biggest eye-opener in The Gourmands’ Way is, without a doubt, its critical assessment of M.F.K. Fisher. The historian in Spring does not take kindly to inaccuracies in his subjects’ own claims (or any made by others who wrote about them)—something that Fisher, it turns out, produced in spades. I have always felt somewhat ambivalent about this sanctified culinary memoirist whose brooding ruminations tend to run astray before returning somewhat grudgingly (and in often less than appetizing ways) to the subject of food. While defending her as an admirable prose writer, Spring nevertheless shatters her towering status as a culinary authority, painting her as a passive-aggressive opportunist who entirely manufactured her reputation as a food connoisseur and was more of a narcissistic fabulist than a trustworthy reporter. To wit, Spring’s hand-picked quotes from her astoundingly peculiar and uncouth editorial contributions for The Cooking of Provincial France, the first installment of Time Life’s prestigious Foods of the World series, as well as his detailing of the embarrassing debacle that followed its publication are among the many guilty pleasures to be found in The Gourmands’ Way. We learn that Fisher handed in a manuscript that was full of disparaging statements (“French cooking means an elaborate and expensive way of complicating or at least masking food with sauces”), going so far as to denounce the French’s purported lack of hygiene and preference for what she considered lowly foodstuffs as “innards.” Perusing her essays now, it occurs to me that Fisher had in fact very little interest in cooking per se, preferring to explore the emotional effect that food and eating—in or out—had on her. She may have been completely self-involved, but she wrote about it with style and depth. Another writer who is at the receiving end of Spring’s reprimand is Julia Child’s biographer (and grand-nephew) Alex Prud’Homme, whom he chastises for, among other slights, underplaying the fact that his great-aunt was born into privilege and was in fact financially independent long before she started her ambitious second career as America’s culinary midwife. This matters because it explains much of Child’s brazen, unshakable persona, which emboldened her to pursue her ambitions, substantially boosted by the means that enabled them and armed with the insouciance of someone who could easily adopt and advertise a quasi-bohemian lifestyle with none of the risks involved. To be aware and wary of this kind of glossing over is crucial in an age when inequitable access to opportunity divides Americans more than ever. Spring’s portrait of Child did not swing my opinion of her as something of a matronly schoolmistress speaking to permanent beginners (a mode that persists in food content to this day), but his touching portrayal of the loving and symbiotic bond Julia Child had with her husband, Paul, made me warm up to her. Ultimately, she comes across as an endearingly charismatic leader who became a spokeswoman for legions who were just as clueless about food as she was. She at least made it her mission to get wise while remaining completely herself. Spring’s lively portrayal of A.J. Liebling convinced me to immediately order his classic essay collection Between Meals: An Appetite for Paris. I did not regret it: The war correspondent–turned–New Yorker staff writer’s hedonistic obsession with women and dining out in Paris, which he had pursued both before and after the war, became the theme of many of his witty articles. Food writing as politically incorrect and unabashedly chauvinistic is as rare these days as, say, the roasted woodcocks Liebling seems to have eaten by the dozen. As to the story of one of the book’s lesser-known figures, wine merchant Alexis Lichine, I found myself surprisingly moved by his dramatic trajectory. Though Spring paints Lichine as a shrewd salesman with serious status-anxiety issues, he manages to also conjure him as a driven and romantic dreamer who moved every mountain to live in high style, wrote one of the most comprehensive guides on wine culture, and managed to maneuver his way to the top of the cagey wine export business. In Spring’s hands, Lichine becomes a textbook example for what happens when one accepts an offer that appears too good to be refused: While selling his trademark made him the wealthy man he had always aspired to be, it also forced Lichine to stand by helplessly as the luxury brand he had painstakingly built was desecrated by its new spokesmen. In one of the book’s many tragicomical passages, Spring describes a television ad in which a rosé bearing Lichine’s name is literally poured into a beer mug while a voice-over encourages the consumer to “drink it with any kind of food.” That would send any wine connoisseur back to his chateau for permanent retirement. The sixth protagonist of The Gourmands’ Way, Richard Olney, was the one I was most eager to find out more about. I have for the longest time felt a quiet admiration and sense of kinship for Olney and always wondered where and how he had acquired his tremendous kitchen skills. His knowledge and talent had made him such an authority on French cuisine that he was held in high esteem even by the crème de la crème of the French culinary world. Spring confirms what I had secretly hoped: that Olney was indeed completely self-taught. He describes with loving care how Olney—a passionate and knowledgeable home cook as well as a painter, a writer, a handyman, and an authoritative oenophile—quietly acquired a deep understanding of traditional French culinary techniques by exploring and experimenting in his humble kitchen, aided by extensive reading, one-on-one conversations with French chefs, and the kind of emphatic intuition that is the mark of a true artist. And with this, the book spells out what sets Olney and Toklas apart from the rest and why their writings, now more than ever, ought to be revisited: Neither saw cooking as a means to show off, to gain status, or to win accolades. And unlike virtually everyone who is currently pushing into the expanding food world, Olney and Toklas weren’t interested in food as a way to become entrepreneurs. Both of them lived simply and modestly, quietly pursuing what gave them pleasure and sharing it generously with the world through their intelligent, intimate style of writing. Though living insistently private lives, they understood that welcoming friends into your home with genuine and generous hospitality is an integral part of a truly cultured and civilized life. At a recent event for the launch of The Gourmands’ Way, Spring was asked which three of his six subjects he would have liked to have as his dinner guests and what he would have cooked for them. He named, as I would have, Liebling, Toklas, and Olney. Even more poignantly, he did not linger much on the question of what to serve, because he has internalized the lesson Toklas and Olney offered by example: The key to an enjoyable dinner is not, though excellent it might and ought to be, the food per se, but the company and the conversation. Tout le monde, à table!